I feel so motivated and excited to try your recipes! I am just curious if there is an easy way to tell what meals can be prepped ahead of time on your weekly meal plans? I always use your meal plans, websites and books to feed my family. Keep posting, please!! I use your meal plans al the time! At home, we only eat skinnytatse recipes. Thank you, Gina! These meal plans are life changing! Thank you! Thank you so much for your meal plan posts. I have been making your recipes for quite some time, but this week, the “wedding diet” started and I decided it was time to get serious. 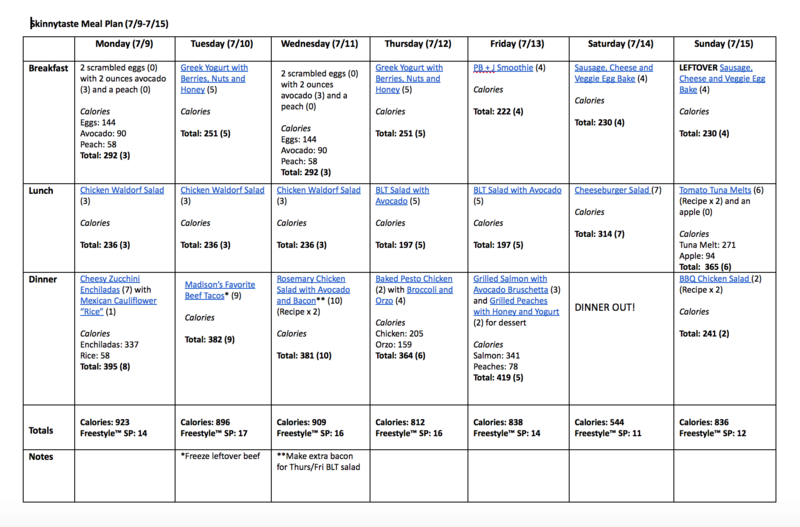 So, I have used this week’s meal plan as my jumping off point. OMG, my husband has loved every thing I have made and didn’t even know we were watching our calories. Your recipes are tasty, filling and your meal plan allows for so much flexibility and enough left overs for several days. The tastes and combinations have kept me interested and focused. Please continue to post — you are my inspiration. Thank you so much for your wonderful work!! LOVE your books and the recipes here! This is my first week fully trying out the meal plan. I’m shifting the days a bit because I need to do the shopping tonight (Monday). I have high hopes! I have definitely enjoyed several recipes I’ve gotten from the site. I’ve just found your blog so I’m not using your plans yet, but based on what I see here, I think I’ll give them a try next week. I like that you provide three basic meals and leave room for snacks, beverages, etc outside the meals themselves. Seems very flexible to me that way. I LOVE using your meal plans. Thank you for providing them weekly!! Love these weekly menus and cannot wait for the new book to come out! Just wanted to let you know the infographic for this week’s menu says Jun 9-July 15, I was skimming quickly and for a second thought I was on an old post from June. I’m new to your web site and am really enjoying it. I use it for the recipes and sometimes just for ideas. I’m making the chicken waldorf salad tonight. I’m new to WW and especially appreciate the freestyle points are all figured out and ready to track. Yes, please continue to share. The archive of previous meal plans are also very helpful, thank you! Being a single working mom trying to eat healthy, these meal plans are a true time saver and I find I spend less time worrying about what to cook and instead enjoy time spent with my two teenage daughters prepping and preparing meals. I find I spend less at the grocery store and when I use this plan along with an exercise program I actually lose weight! Coupled with using fresh in season produce and simple ingredients, winner all around! Link for Rosemary Chicken Salad goes to Madison’s Favorite Tacos recipe. Your website is so completely impressive. It would be a massive amount of work. Thank you!! Hoping you will be blessed! Thank you Gina, I was getting so tired of trying to figure out what to have for meals on the Weight Watchers freestyle plan. 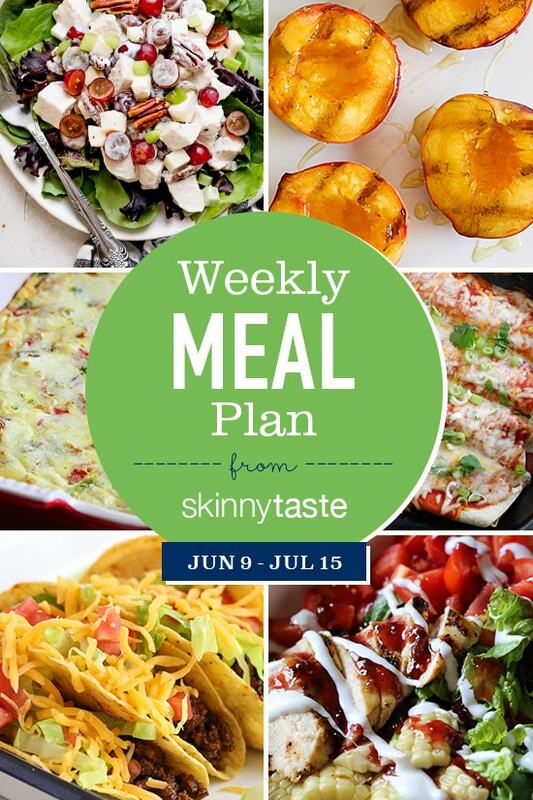 Your website and meal plans are totally awesome, and such a lifesaver! Thank you! I love your meal plans! I always use a few of your ideas in my family plan. The plans have helped me discover new family favorites for us! Thank you for taking the time to post every week! Please keep the meal plans coming. Love using them. Thanks! I’m confused about the kale in the BLT salad. It’s not listed on the shopping list (or at least I couldn’t find it) and I’ve never heard of that particular type of kale. Thanks and I love your meal plans. Hi Judy! So sorry, it was the wrong link for the salad…it is updated now…no kale. Thank you for all you do. I’m sure it’s a ton of work. Thank you for these meal plans! The wide variety of recipes works well for me, and they are easy to follow. I also love the oh-so-handy grocery lists. I look forward to your new cookbook. My Skinnytaste cookbooks are my go to resource for healthy recipes. I regularly use your weekly meals plans. It truly takes the guess work out of planning. Please keep sharing…thank you. Can’t wait for your new book!!! i would just like to say, i really appreciate your meal plans. I have been using them from the beginning. Thank you for the plans – I have been following you since 2012 and love the variety. Would love to see more quick prep ideas for sides or mains and / or prep and freeze for weeknight meals because during the week it is tough with work, classes and schedules. Thank you again. The rosemary chicken salad link takes me back to the tacos. Just so you know. I was just going to mention that. ? My husband and I have been using the meal plans for about three months and it’s been a huge help for our diet. The amount of time/prep for two adults who work full time, commute, and freelance on the side seems like a lot, and multiplying the breakfasts and lunches and dividing the recipes for dinner makes shopping tricky. But the wonderful thing is that it takes all of the guesswork out of our meal planning and every time we whip up a new, delicious concoction we say “Thank you, Gina!” We’ve even skipped the official meal plan once or twice and made a “best of” week. So I thought we’d say it here… Thank you! Please keep posting! Thanks Amanda, I am so glad to hear this!